Native to southwestern U.S. and Mexico. 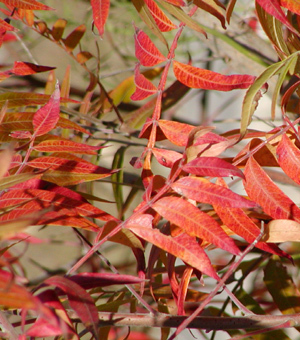 Foliage is dark green in summer turning to rich red, crimson, and scarlet in autumn. Leaves are alternate, compound, pinnate, 9 to 21 leaflets, oblong-ovate to lance-ovate, 1 3/4" to 4" long. Desert sumac is compact and dense in youth becoming more open with age. With ascending and spreading branches, it has irregular shape and is picturesque. Flowers in terminal and axillary clusters, petals white. Fruit is ovoid about 1/4" long, red, and somewhat hairy. 15' tall x 12' wide. Outstanding autumn color and drought tolerant..